Door hardware includes the knob or a handle and all latch and locking mechanisms. This is technically known as a lockset, whether the hardware includes a lock or not. Different locksets are designed for different applications. Once you narrow down your decision to the type of lockset you need for the application, you can focus on the style and finish of the hardware. Keep in mind that whatever type you choose, quality locksets are usually worth the extra cost and will perform better and last longer than bargain hardware. 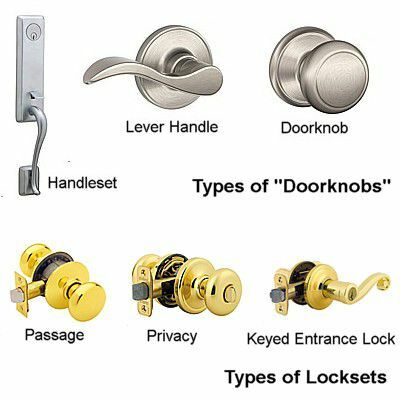 Although you may expect a doorknob to be a round or square knob, it may not be a knob at all. It may be a lever-type handle, or it may be a handle set, which is a combination thumb-latch-and-handle used on exterior entry doors. Lever handles are easier to grab than doorknobs and are an approved operating device meeting ADA (Americans With Disabilities Act) or barrier-free or accessible design requirements. Also worth noting are the different ways the doorknob attaches to the lockset spindle. On older-style door hardware, the doorknob is attached using an exposed setscrew that secures the knob to a square threaded spindle. When turned, the spindle rotates and operates the latch mechanism. The downside to this style of attachment (besides the unsightly setscrew) is that the doorknob often becomes loose and may end up spinning in your hand. The currently popular method of attaching a doorknob to the spindle uses no screw at all, but rather a concealed device called a detent. This type of ”no-screw” doorknob is easily removed using a small flat-blade screwdriver. A passage lockset does not contain a lock, as it is intended for passage from one area to another. These are the most common locksets used on interior doors, including closet doors, pantry doors, and many bedroom doors. Privacy locksets are used for access to rooms that need privacy, such as bathrooms, bedrooms, or home offices. The "privacy" side is lockable by a push button or turn button, usually on the inside of the door. On the outside, there is no lock, but there may be a small hole in the knob that allows the use of a small emergency key to unlock the door if necessary. The emergency unlock feature is important as a means of easy access in the event that someone inside the bathroom falls or has another type of emergency and can't unlock the door. A keyed lockset is lockable on both sides and can be used with interior or exterior applications. It can be locked and unlocked by using a key on the outside, while the inside may lock and unlock with a turn button or a key. This is the standard lockset for entry doors and is also useful for securing items in closets. Dummy, or non-functional, locksets have just a knob or handle on each side that does not turn or activate any type of locking or latching mechanism. You see them on doors for linen closets, broom closets, and the like. When installed, they look just like standard passage locksets but function essentially like cabinet pulls.